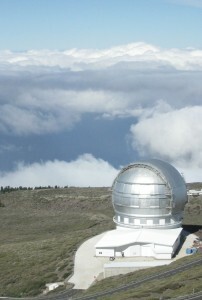 The 10.4m Gran Telescopio Canarias (GTC) on La Palma--the largest optical telescope in the world! Every November the Instituto de Astrofísica de Canarias (IAC) hosts a winter school on a particular astronomical topic in Tenerife, Spain, part of the Canary Islands. I attended this year’s school and got a two week crash course on “The Astrophysical Applications of Gravitational Lensing” from experts in the field while hanging out on a volcanic island with about 50 postdocs and graduate students from all over the world. In addition to daily lectures, the IAC organized two days of excursions to the local observatories–one on Tenerife and the other on a neighboring island, La Palma, home of the Gran Telescopio Canarias. The lectures helped me better understand my own research and opened my eyes to the many uses of gravitational lensing, some of which I didn’t even know existed before the school! Here I’ll outline a few of the ways astronomers use gravitational lensing to study the Universe. A horseshoe-shaped image behind a single red galaxy. Photo credit ESA/Hubble and NASA. First off, what exactly is lensing? 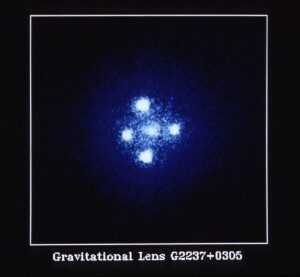 Einstein’s theory of general relativity naturally predicts gravitational lensing. In general relativity, mass curves spacetime, which means that massive objects will deflect all things that pass by them–including light rays. This means they can focus those rays similarly to a piece of glass. The distortion of spacetime allows a single beam of light from a distant source to reach us from multiple directions; thus, background images will be stretched out or split into multiple images if they lie behind a massive object. To visualize the effect, picture looking at a marble through the bottom of a wine glass, as shown in this video (original link here). When the marble (the background object) nears the center of the glass (the lens), the image is stretched all the way around the stem, forming a ring. We see strikingly similar “Einstein rings” in nature: background galaxies which are stretched into giant arcs encircling foreground galaxy clusters. Neat, right? But why use lensing for astronomy? Recall that the pie chart of mass-energy in the Universe shows 23% dark matter, 72% dark energy, and a mere 5% baryonic (normal) matter. So far only the baryonic matter has been confirmed to emit light detectable by our telescopes (although dark matter may emit gamma rays). Gravitational lensing can probe both dark matter, which only interacts via gravity, and dark energy, which is making the Universe expand at an accelerating rate. What’s more, lensing acts on a remarkable range of scales from extrasolar planets that magnify stars in our own galaxy to galaxy clusters that magnify the most distant quasars. It would be impossible to tell you about all of the applications of lensing in a single post, so I’ll just sample a few of them below. Closest to home we can use gravitational lensing to search for extrasolar planets. One star can lens another star; as the foreground star passes in front of the background star, it will briefly split the background star’s image into several tiny images that will blur together into a single, brighter image. When this happens we say the background star is microlensed. If the foreground star has a planet it will make its own contribution to the microlensing event, detectable as a single sharp spike in the brightness of the background star as the planet passes closest to the star’s line of sight. In contrast to other exoplanet detection methods which preferentially find exoplanets that live close to their host stars, microlensing is sensitive to planets near the frost line, where Jupiter-like planets form, and to free-floating exoplanets, or exoplanets that have been kicked out of their home stellar system. The microlensing events are bright enough to see with a small telescope, but before you run out to your backyard I should caution that they are also extremely rare. Even after monitoring many, many stars for several years, microlensing surveys like OGLE have only found about a dozen exoplanets this way. Farther away, we can model the masses of galaxies and galaxy clusters that lens background galaxies. This is the domain of macrolensing, lensing that remains constant in time and acts on scales large enough to be resolvable with current telescopes. Strong lensing occurs when a background and foreground galaxy lie close to the same line of sight, causing the background galaxy to appear hugely elongated and split into multiple images. Strong lensing puts excellent constraints on the masses of the foreground lensing galaxies – which are, like all galaxies, mostly dark matter. In special cases irregularities in an image can reveal dark matter substructure or a satellite galaxy: if the lens contains dense clumps, part of a lensed image may be more or less magnified than expected. Weak lensing, by contrast, occurs for background galaxies that lie farther from the line of sight of the lens; instead of a dramatic effect, many small distant galaxies are slightly distorted. This technique can yield the total masses of galaxy clusters. Note that for weak lensing, we must average over many background galaxies since individual galaxies come with their own intrinsic shapes. 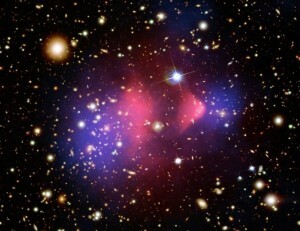 Weak lensing can map out the distribution of mass inside a galaxy cluster, and the weak lensing maps of individual clusters like the Bullet Cluster provide the best evidence for dark matter to date: when two clusters collide, the majority of the baryonic matter–the hot gas–feels the impact, while the rest of the material–dark matter and individual galaxies–travels straight through. This results in the baryonic and dark matter being temporarily separated in space, and we can use weak lensing to show that the majority of the mass in the cluster is not in the same place as the baryonic matter. Astronomers also use the results of weak lensing surveys to compare the distribution of cluster masses to cosmological simulations in order to test our theories of structure formation. In addition to analyzing the lens itself, we can study the objects behind the lens. Just as a telescope lets us study a star too dim for the naked eye to see, lensing galaxies and galaxy clusters act as giant telescopes that can magnify background galaxies by tens to hundreds of times their original brightness, providing a window into the early Universe. (This is my research!) Multiply-imaged quasars are also rewarding to study, if a bit more complicated. A quasar is the central engine of an active galaxy, an incredibly bright source of energy powered by accretion of material onto a supermassive black hole. This means that, although it is very powerful, a quasar has a very small physical size compared to its host galaxy. The behavior of a microlensing event depends on the size of the background source: the larger the physical extent of the source, the more the signal of a microlensing event is smeared out in time, as the foreground lens passes across the object and magnifies pieces of it bit-by-bit, instead of all at once as it would a point source. A quasar behind a single galaxy will not only be strongly macrolensed by the lens galaxy as a whole, but since the quasar has a small angular size, the individual images will also be microlensed by stars within the lens galaxy as it slowly drifts in and out of alignment with them. Thus, when astronomers model the changes in brightness due to microlensing stars within the lens, they can deduce the size of the lensed quasar accretion disk: a bigger disk will show a smaller microlensing signal. Trying to measure this size without lensing would be like trying to resolve individual grains of regolith on the Moon: basically impossible with current technology. 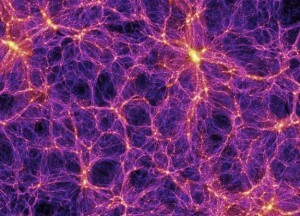 A snapshot of the "cosmic web," the large-scale structure of filaments and voids that fills the Universe, from the Millennium Simulation (Springel et al. 2005). As light rays travel through the Universe they will be deflected by any mass they encounter along the way. The weak lensing distortions felt by the images of galaxies as they travel through the large-scale structure of the Universe is known as cosmic shear. We can quantify the distribution of mass in the universe by mapping out cosmic shear and counting up the strength of density fluctuations of different sizes. This is analogous to the study of the cosmic microwave background, except that the cosmic microwave background shows us the initial density fluctuations at recombination (soon after the Big Bang), while cosmic shear shows us how the original fluctuations developed up through the present day. Cosmic shear is thought to be the most promising way to measure dark energy and get a handle on how quickly the expansion of the Universe is accelerating. Phew! 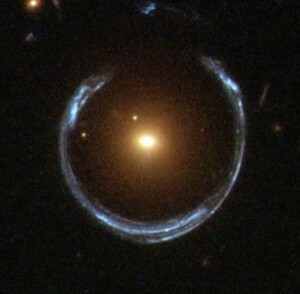 I hope I’ve convinced you that gravitational lensing can do quite a lot. Watch out for more astrobites on these and other applications of gravitational lensing as we go forward into the bright, lensed future. The information here is based on lectures by Sherry Suyu, Verónica Motta/Emilio Falco, Chuck Keeton, Joachim Wambsganss, Andy Gould, Peter Schneider, and Chris Fassnacht. PDFs of the lectures are available on the Winter School website: http://www.iac.es/winterschool/2012/. My conference expenses were funded in part by the American Astronomical Society International Travel Grant; the University of Maryland Goldhaber Travel Grant and International Student Support Award; and the Winter School itself.